I grew up in New Jersey, which has THE BEST Italian food this side of Italy. For me, Italian = Pasta. Pasta is delicious, but too much is not good for the waistline. How do you bring the flavor of Italy to things other than pasta? Ladies, meet the ZUCCHINI. Yes, it’s all the rage because there are awesome contraptions that transform it into noodles. Noodles and sauce? Honestly, I find that so boring. We can do better than that. I give you… Stuffed Zucchs! Let’s start with the cherry tomatoes! Using a toothpick, poke a hole in each–This will allow the balsamic vinegar to really marinate into them–then toss them in 1/4 cup of balsamic vinegar and allow them to marinate in a closed container for 4 hours. In a small bowl, combine your garlic, almonds, capers, ½ the parsley and basil with 2 TBSP of EVOO until it’s like a paste. (You can use a food processor as well) Salt and Pepper to taste. Place your Ricotta cheese in a large bowl and combine with paste, mixing evenly. Take your Ricotta mixture and fill the zucchini shells and sprinkle olives on. 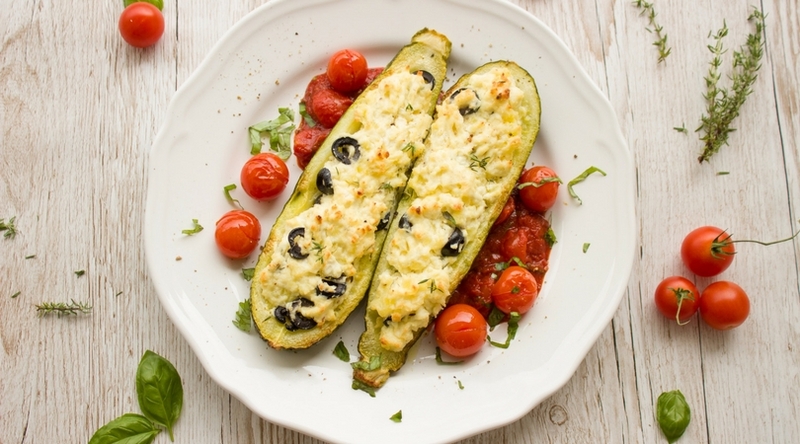 Place the zucchini halves in a glass baking dish, Sprinkle with remaining basil and parsley, then the mozzarella and Parmesan. Bake at 350 degrees for 20 minutes. Don’t Forget about the tomatoes. You’re going to place them on a cookie sheet and allow them to bake in the oven for the last 10 minutes of bake time with the zucchs! You can get really creative with this dish depending on what you want to stuff it with! Have fun in the kitchen and remember, you can have healthy FLAVORFUL food!